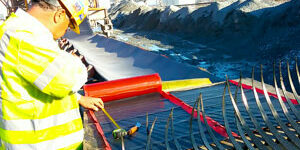 We have the crews and equipment to string, install, vulcanize or fasten and wind up virtually any belt, large or small. Our experienced field technicians have seen almost every situation that can shut a facility down and they know how to fix it, safely and fast. Whether aggregate, foundry, pulp and paper, power generation, recycling or portable equipment, our team can handle the job. Singer Field Technicians are Factory and MSHA Part 48 Above Ground Certified and committed to our company’s focus on Safety. 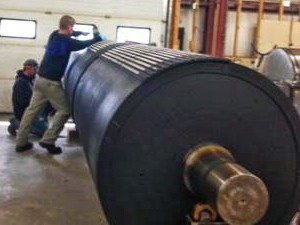 Our large inventory of ready to ship belts can support the most popular manufacturers for OEM machines such as mobile crushers, road wideners, pavement wideners, and mobile milling machines. We stock 2 & 3 ply constructions with various cleat designs in our expansive inventory – all so we can get you back up and running – fast. 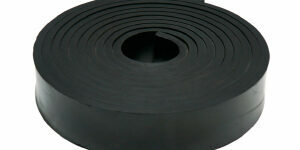 Our high strength cleated rubber belts can withstand the impact of heavy and sharp materials at the loading points. 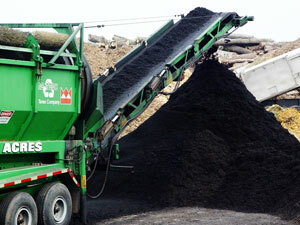 We also stock many popular hot asphalt belt assemblies for road wideners with high-temp and oil resistant covers. Our family of companies regularly re-lags customer pulleys with press cured rubber lagging (diamond or smooth) ceramic, and weld-on. Vulcanized under 20 tons of pressure, our lagging cannot “glaze” over, so it maintains it’s high coefficient of friction during the entire life of the rubber. Our factory trained technicians strip the old rubber, prepare and prime the pulley, and cold vulcanize the rubber using methods which substantially exceed OEM adhesions. This gives you significantly longer service life than original OEM rubber lagging. It’s available in both 1/2″ and 1″ rubber thickness. 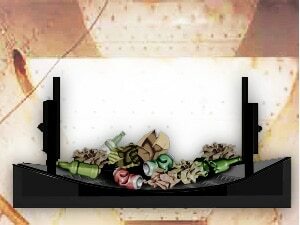 Reduce your spillage at loading and transfer points on conveyor belts with SBR skirt board rubber and protect your equipment at the same time. Abrasion and weather resistant for tough applications in all types of environments. Featuring 1,000 lb. tensile strength and 300% elongation in hardness of 55-60 durometer in gauge. 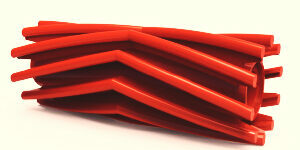 Materials: SBR Rubber, Gum Rubber, Urethane, PTFE/Teflon, UHMW, Other High-Performance Polymers. 1/4″, 3/8″, 1/2″, 3/4″ and 1″ Thickness Cut from 50 ft. rolls, 4 inches to 12 inches wide. Also available in full slabs (48 inches wide x 50-ft. roll). We test hoses in-house, in the field and at customer locations to ensure the safety of your workers and your customers. Testing also guarantees that your hoses will meet your specific requirements in the applications. All of our companies that offer OnGuard™ Hose Management services have hose testing capabilities up to 50,000 psi, utilizing various in-house & mobile hose test equipment. 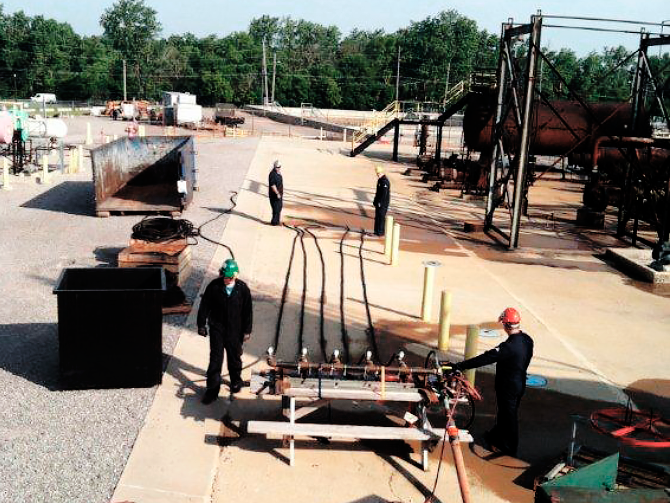 We utilize manifold test systems to speed the test cycle of high volume hose testing. This ensures faster delivery and shortened maintenance downtime. Why should I test? For peace of mind. Our hose testing is performed with state of the art test equipment. All of our procedures follow industry standards documented in the Hose Safety Institute’s guidelines for industrial, hydraulic, metal and composite hoses. For more information visit www.nahad.org or click here to view these standards. Many of the Singer Equities family of companies utilize hydraulic express vans to fabricate hydraulic assemblies on site. Our certified hose technicians provide quick turnaround to keep your process moving. Our trained field technicians are experts in the fabrication of hydraulic hose assemblies, have passed rigorous training requirements, troubleshoot and replace defective components. 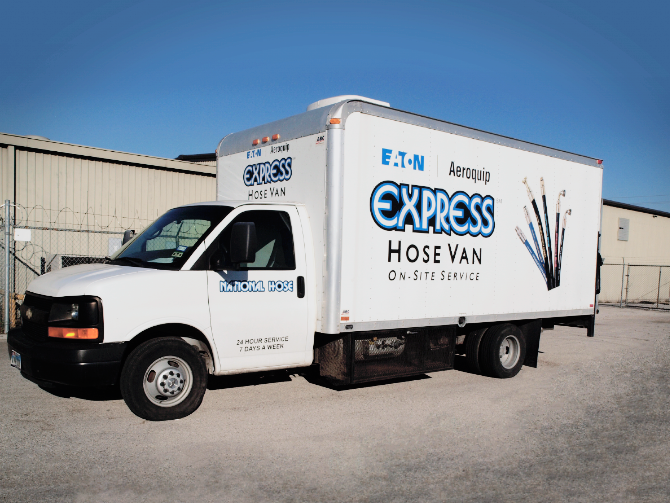 Our hose shop on wheels comes complete with hydraulic hose, fittings, adapters, and a crimper to fabricate hose assemblies.